I am very picky when it comes to slow cooker recipes. They have to be easy to put together in the morning. They have to be able to cook all day while I’m at work (if not, what is the point?). They have to be truly delicious. 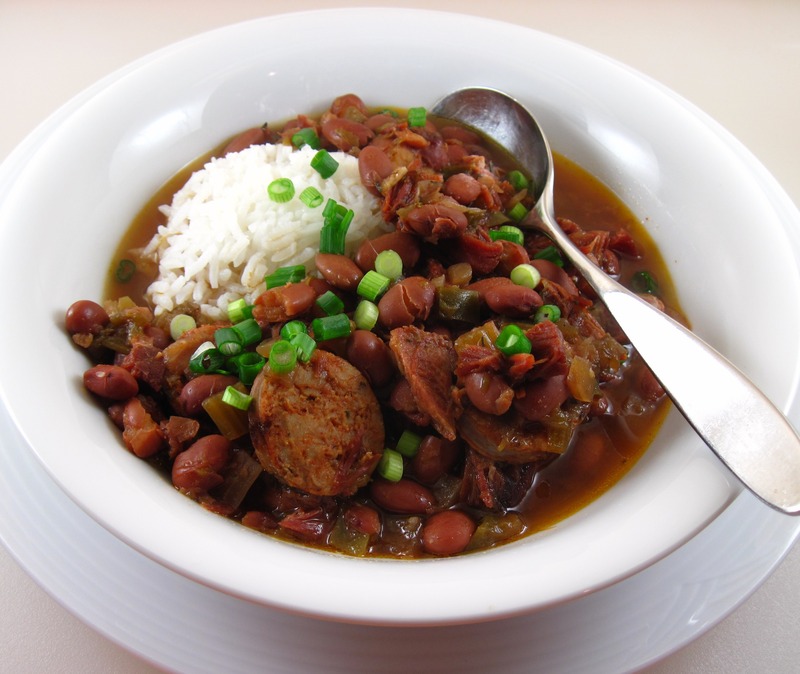 I haven’t found many recipes that qualify, but Slow Cooker Red Beans and Rice is a winner! It took me, maybe, 20 minutes to put it together in the morning. That included time to take photos. To save more time in the morning, I don’t see why you couldn’t chop the vegetables and measure the spices the night before. They could be combined in one bowl and refrigerated overnight. 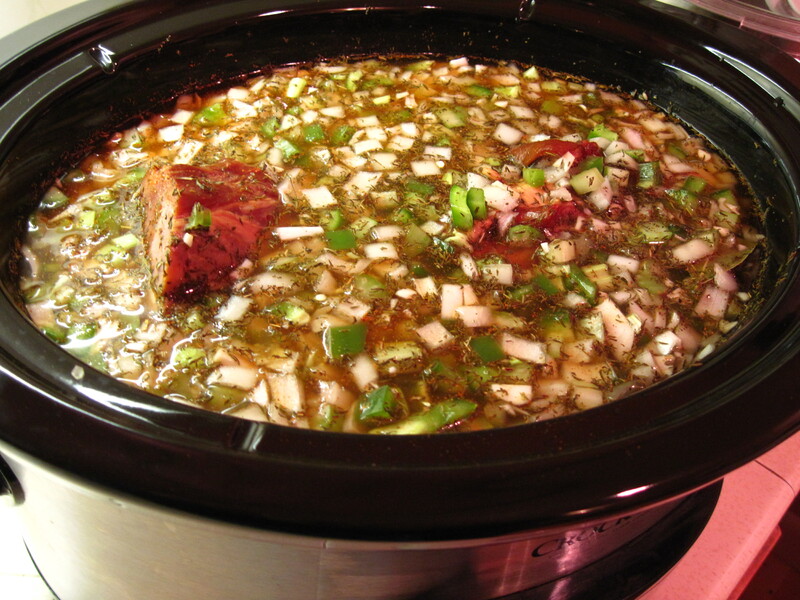 In the morning, just toss it all in the slow cooker with the soaked beans, water, and ham hock! I found the original recipe, from an April 2003 issue of Cooking Light, online. It called for cooking the Slow Cooker Red Beans and Rice on high heat for 5 hours. I wanted to cook it all day. I put everything in the pot and set it on High for one hour while I got ready for work. When I was ready to leave, I set it to Low for the day. When I got home the aroma was mouth-watering! I checked it at 5:30 in the evening, 11 hours after I had first turned it on in the morning, and the beans were cooked perfectly! The flavor was fantastic! I made some rice and cooked the sausage to add to the beans and dinner was ready! 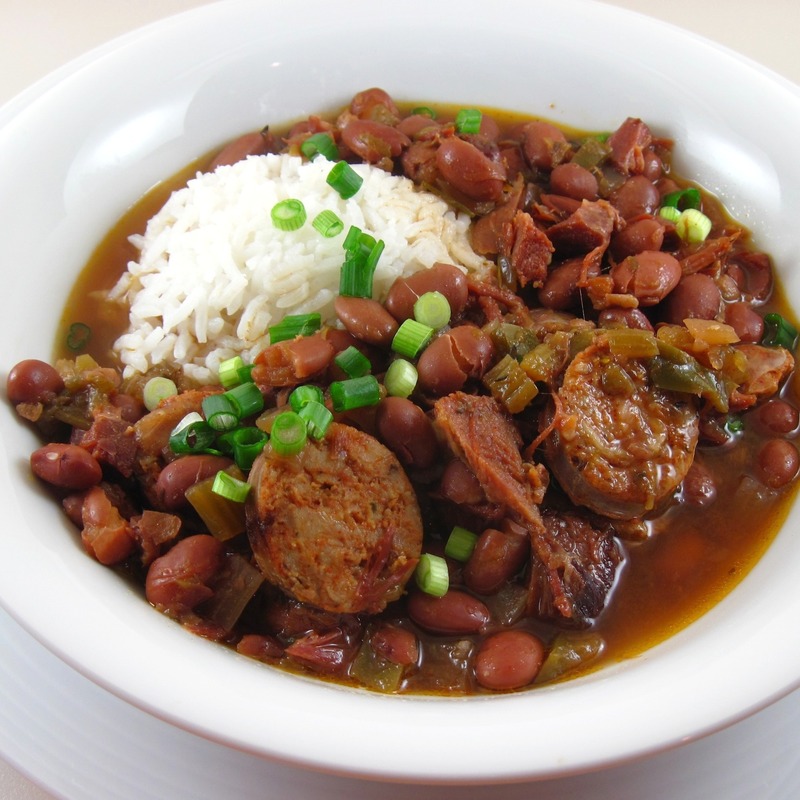 Bob (who knows his Red Beans and Rice from his years in New Orleans) gave it a big “thumbs up” and 5 stars! This one’s a keeper! Slow Cooker Red Beans and Rice is spicy, but not overly so. Serve with Tabasco for those who want to take it up to the next notch! 1. 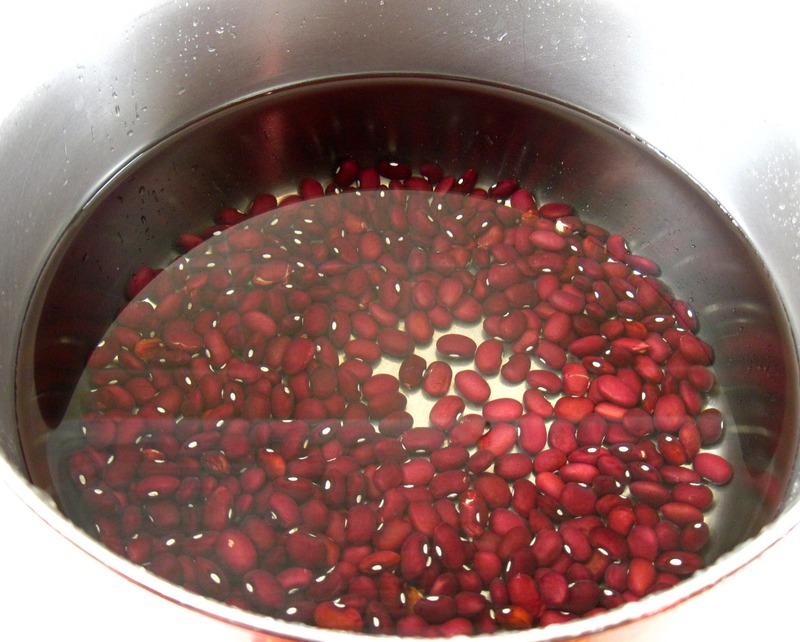 The night before cooking, rinse the beans, and cover with plenty of water. Cover the pan or bowl and let them soak overnight at room temperature. 2. The next morning, drain the beans. 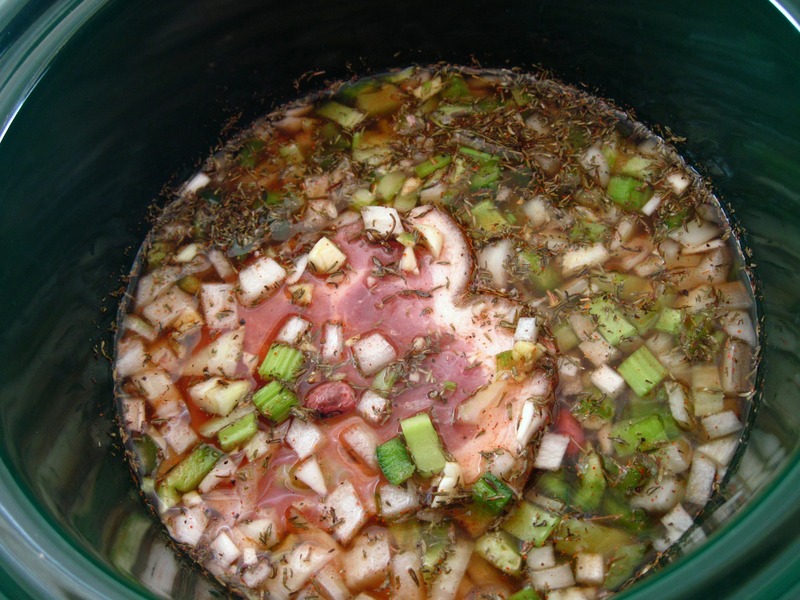 Combine them with the 3 cups water, onion, bell pepper, celery, thyme, paprika, cayenne, black pepper, ham hock, bay leaf, and garlic in a 3½ – 4 slow cooker. Set on High. 3. After about an hour, lower the heat to Low. Let cook all day, for 9 – 11 hours. 4. Remove the ham hock from the beans and set aside to cool a bit. 5. In a small skillet, cook the sausage until done. Slice and add to the beans. 6. Add the ½ teaspoon salt to the beans. 7. Remove the meat from the ham hock and cut in bite-sized pieces; add back to the beans. I originally made this recipe in my 3½-quart slow cooker. Yesterday I doubled the ingredients and successfully made it in my 6-quart slow cooker. It worked beautifully to make a fabulous meal for 7 with leftovers for Bob and me. Paired with rice, it would have easily served 10-12 people. 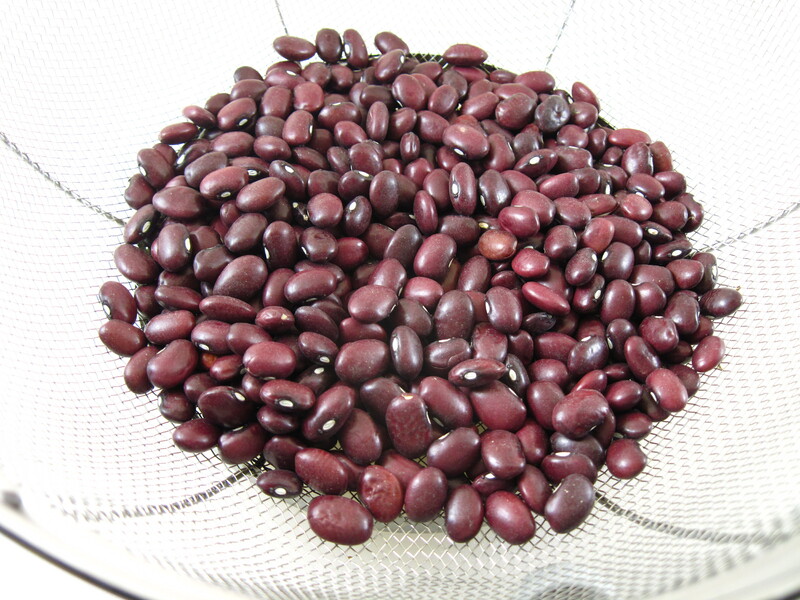 This time I used Hempler’s Andouille and Camellia Red Kidney Beans, which are the very best beans to use for Red Beans and Rice. I was introduced to them by one of my Louisiana cousins. Use them if you can find them; they do make a difference! Instead of cooking the andouille in a pan, I used my steamer pan to steam it for about 15 minutes before slicing it and adding it to the slow cooker. It was a good way to extract some of the fat. You could also just slice the sausage and add it to the cooker for the last hour or so. I doubled the ingredients to fill my 6-quart slow cooker. You are wishing for a trip to NOLA…I can tell! I love Red Beans and Rice. Will definitely have to try the slow cooker version. I’m always wishing for a trip to NOLA, Gwen! 🙂 I’m enjoying your posts and great photos from your recent trip. I was amazed at how well the Red Beans and Rice turned out in the slow cooker. I definitely recommend it! That looks delicious!! Great to have recipes like this that are so easy with working. Slow Cookers are wonderful, and this recipe looks so good. Does your slow cooker have a removable liner? You can prepare everything the night before, put in the removable crock, refrigerate overnight, and the in the morning remove from the fridge and plug it in. It does have a removable liner! Great idea, Becky! Thanks! With my new work schedule, I need to start relying on my slow cooker more. What a great recipe to do so! This looks so hearty, and I can only imagine how great it smells after cooking for hours. Thank you so much for sharing with me tonight. I hope you have a weekend full of love, laughter and great food! One meal in a bowl! This is lovely! I want to try this one out. I will probably consider this as a perfect meal. 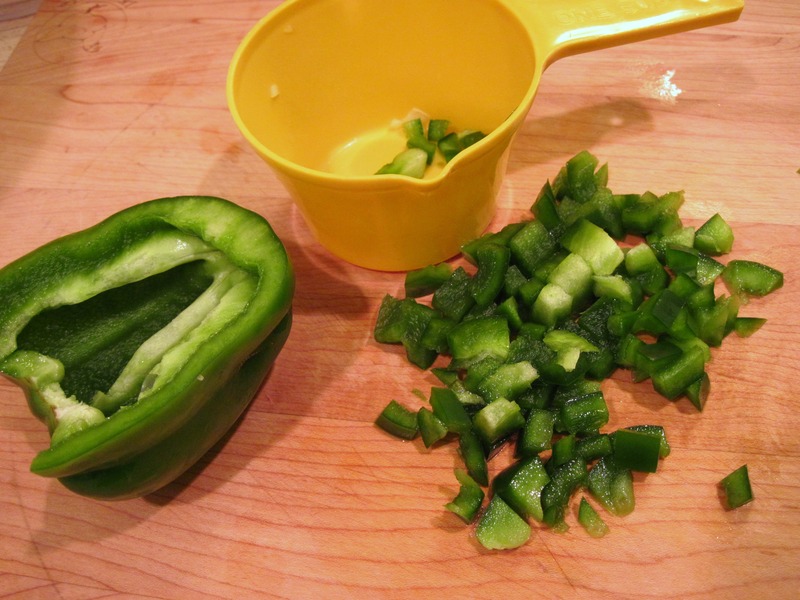 I love using the slow cooker – what a great meal! I havent made red beans and rice since this time last year because its really not a fan favorite in this house – but I love it. 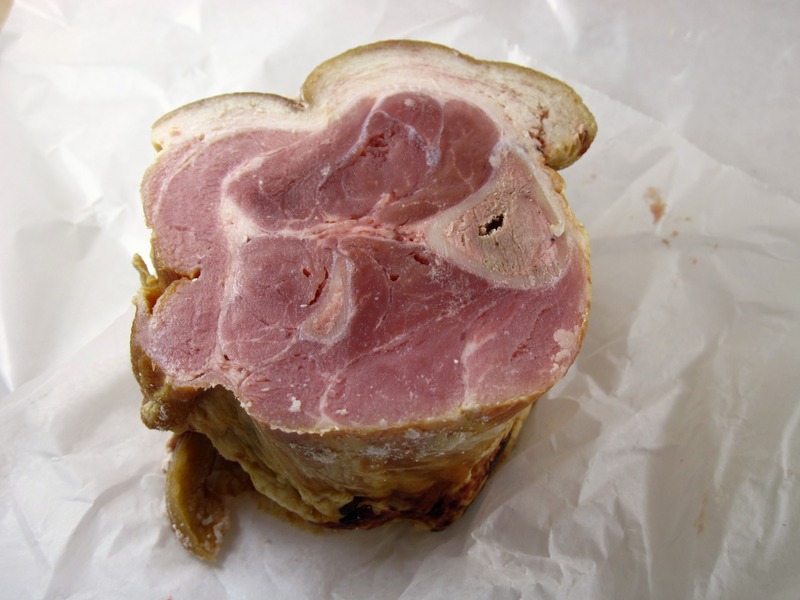 Do you think I would be able to replace the ham hock with porchetta? Thanks! I would think you could use porchetta instead of a ham hock, especially if you have about a 1 pound chunk of it, instead of thin slices. I have never made anything like this, but I can see I’ve been missing something good! I love slow cooker recipes. It’s such a tease to smell good things all afternoon and have to wait to eat it! Thank you for sharing this with us! I hope you are having a good weekend! You know, if there was anything that would make me like beans, this recipe might be it! I just can’t get over the texture of them usually, but this recipe looks great! Where do you find such “meaty” ham hocks? Around my area they are fatty and not much meat. When i cook beans and use one I have to skim the fat off before I can serve them..Also where can i find the sausage like you use? The sausage around here is the processed kind full of all kinds of additives plus very fatty.. Troy, I get the ham hocks and sausage at a local gourmet supermarket (Metropolitan Market for those of you in the Seattle area). 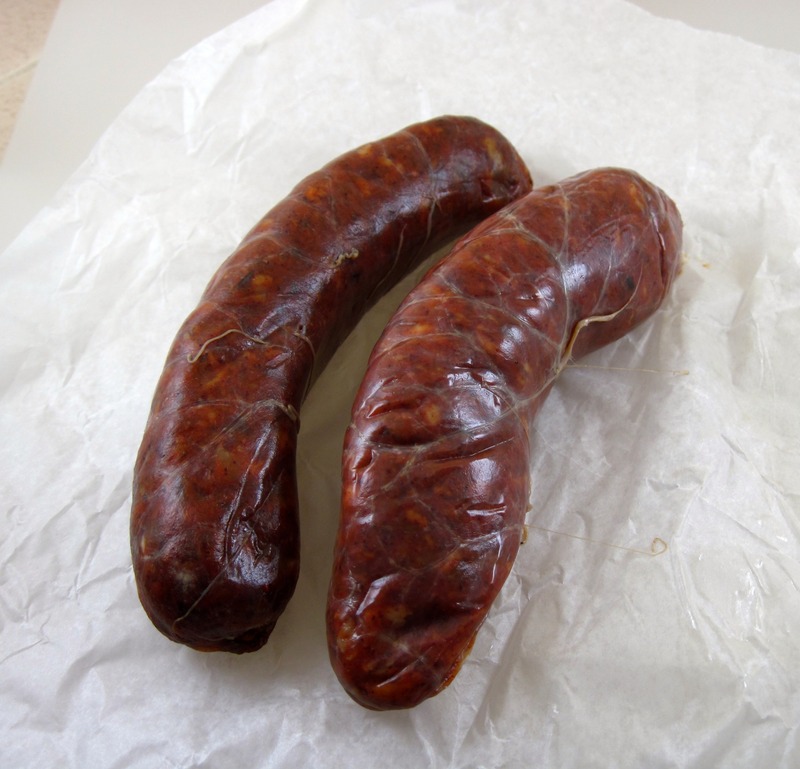 They have high quality meats and make their own sausage with all natural ingredients. 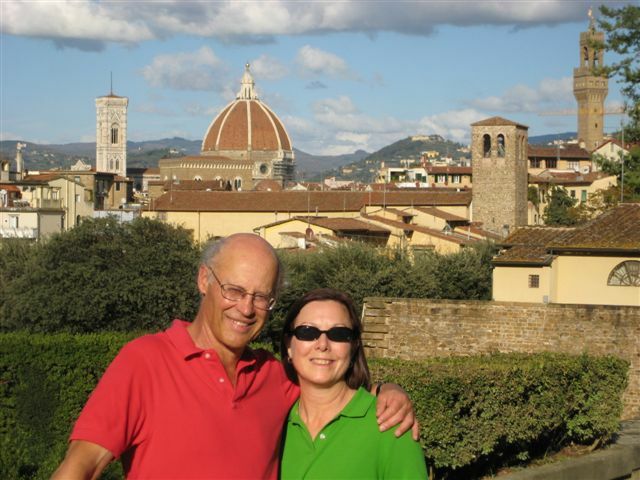 Try an upscale market or butcher shop, if you can. Good quality meat does make a huge difference. I do realize that I am very lucky to have so many options. There are 5 different major supermarkets in my neighborhood, plus a butcher shop, seafood market, produce stands, and a weekly farmer’s market. My mom is from Puerto Rico and she makes red beans with jowl but doesn’t prepare it in the slow cooker so not sure how it would turn out!